Food security has been an obstacle to reaching an 11th-hour agreement at the WTO's 159-country summit in Bali. And now India's trade minister, Anand Sharma, has left little hope for a breakthrough. If completed, the deal could add nearly $1tn (£617bn) to the world economy. India has said the planned deal could endanger domestic grain subsidies designed to help feed India's poor. The US trade representative, Michael Froman, asked the WTO's member economies to work past their differences in order to help finalise the deal during the Bali summit. "Let us not sugar-coat reality," said Mr Froman. "Leaving Bali this week without an agreement would deal a debilitating blow to the WTO as a forum for multilateral negotiations,'' he added. 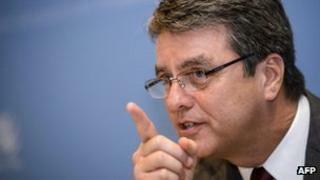 The head of the WTO, Roberto Azevedo, had also earlier called on ministers to come to an agreement. Diplomats from the WTO's member countries held talks in Geneva in the run-up to the Bali summit, but failed to agree on the guidelines and rules governing a potential deal. Among the issues discussed in Geneva was agriculture and the sustainability of food security programmes, such as the one being run by the Indian government. Another key area of discussion included rules that would streamline customs procedures and speed up global trade. Some reports during the talks in Geneva indicated that India had already taken a hard line on the issue of food subsidies in an attempt to win more concessions. Analysts said that given the short time-span of the meeting in Bali, together with the stance that some WTO members had adopted on key issues, it was unlikely a deal would be agreed.